Desert white sage body butter. Indulge your senses with this rich natural body lotion infused with 100% therapeutic grade organic essential oils. 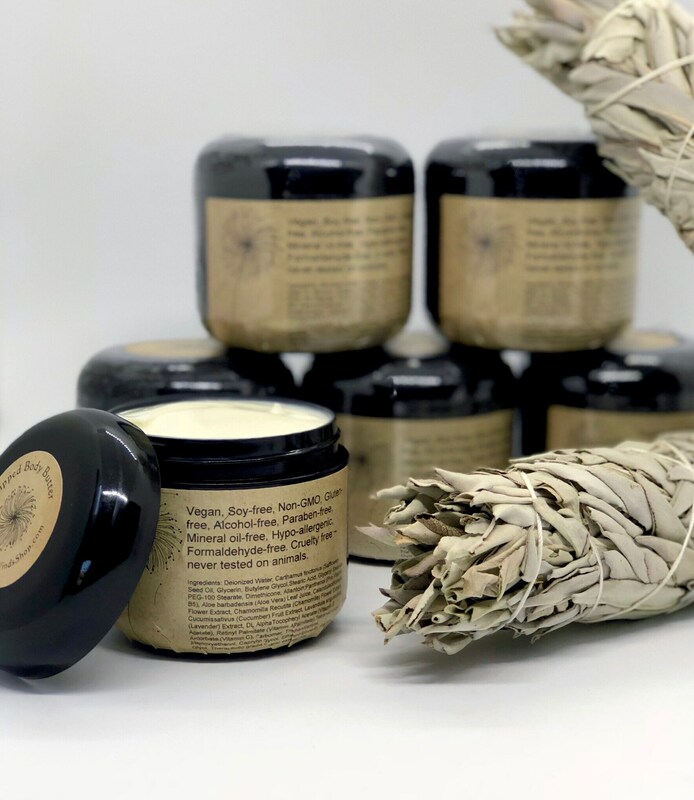 You will receive 4oz of nourishing and healing ingredients leaving your skin feeling soft, refreshed, and moisturized, without any heavy greasy residue. 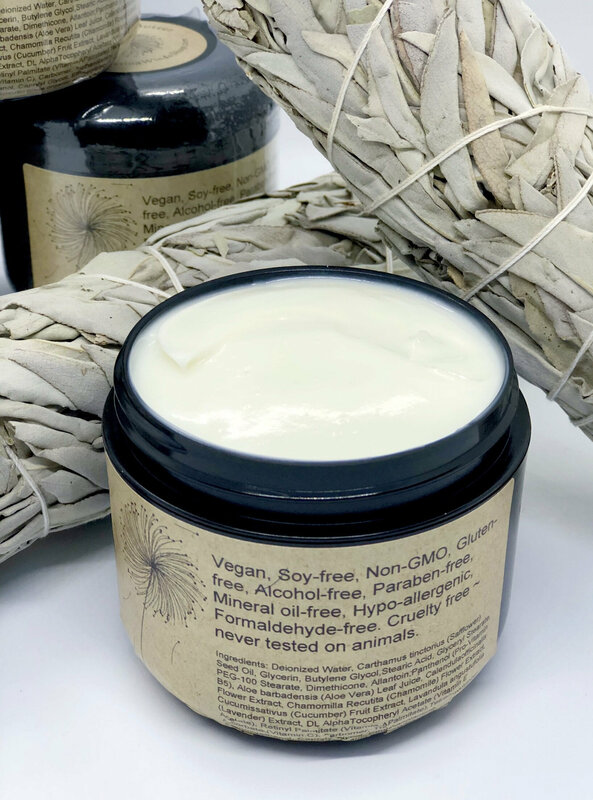 This lotion is vegan, soy-free, non-gmo, gluten free, alcohol free, paraben free, mineral oil free, hypo-allergenic, formaldehyde free, and cruelty free. This body butter will arrive in a BPA Free food grade cosmetic jar sealed fresh with a tamper evident seal. Ingredients: Deionized Water, Carthamus tinctorius (Safflower) Seed Oil, Glycerin, Butylene Glycol,Stearic Acid, Glyceryl Stearate, PEG-100 Stearate, Dimethicone, Allantoin,Panthenol (Pro-Vitamin B5), Aloe barbadensis (Aloe Vera) Leaf Juice, Calendulaofficinalis Flower Extract, Chamomilla Recutita (Chamomile) Flower Extract, Cucumissativus (Cucumber) Fruit Extract, Lavandula angustufolia (Lavender) Extract, DL AlphaTocopheryl Acetate (Vitamin E Acetate), Retinyl Palmitate (Vitamin APalmitate),Tetrahexyldecyl Ascorbate (Vitamin C), Carbomer, Triethanolamine, Phenoxyethanol, Caprylyl Glycol, Ethylhexylglycerin, Hexylene Glycol, therapeutic grade essential oils. Wonderful scent and texture! Very fast shipping too! it has many other essential oil in it, can hardley tell theirs sage init. it is lovley body lotion. Smells great, chases evil spirits away jk, In all reallity I will buy this as much as possible in future. Arrived before expected. Great shop lots of love poured in each drop. Gave as a gift to my daughter and she loves it says it makes her skin feel so good.